This recipe is quite versatile, in the sense that one can use anything from coconut milk to coconut water to prepare it. There some already made coconut milk in containers and there is the fresh one which you have to squeeze out of the coconut after blending it. To make coconut milk, break a coconut, remove the meat, cut into little pieces and blend along with some warm water. Pour the blend into a bowl, add some more water if needed and pour through a fine mesh sieve while squeezing out the juices. Easy right? No more suffering and grating coconuts like our mothers used to have us do. 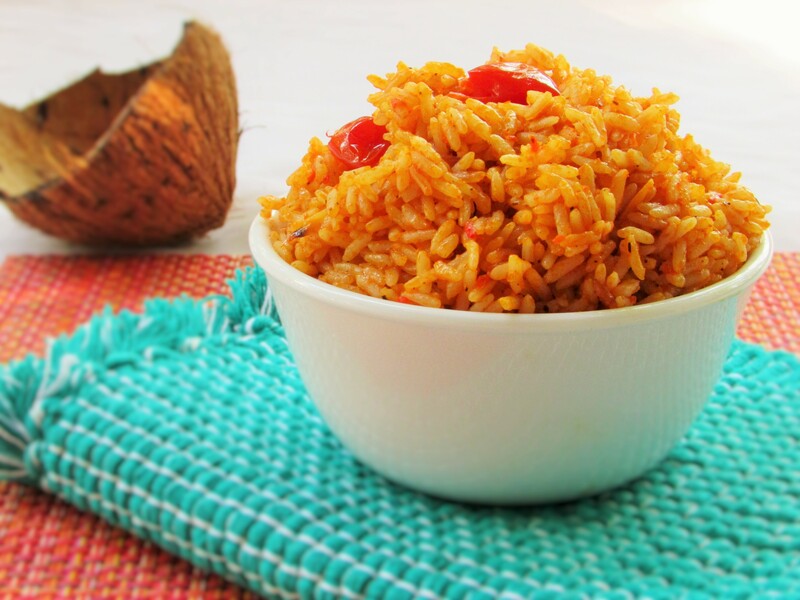 Those were the days we used to dread making coconut rice 🙂 Not anymore. Eureka! heat up a pot with butter and coconut oil, sauté onions and the bay leaf until the onion is translucent. Pour in the thyme, black pepper 1 Onga cube, white pepper and curry. Sauté for another 2 minutes. Add the tomato paste and fry until grainy; then add your boiled tomato mix and garlic and keep frying. Once the tomato paste and pepper mix is properly fried, it will look a little dark and the oil will float to the top. 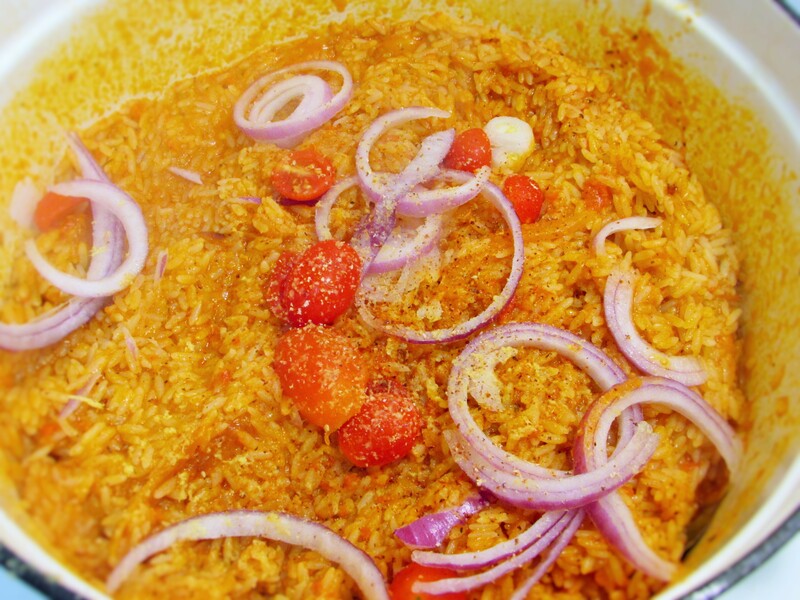 Remove the pot from the heat; then pour in the rice and mix with the fried tomatoes until each grain is coated with the mix. Pour in coconut milk just until a little above the rice. If the coconut milk is not enough, top off with some meat stock or water and check for seasonings(do not stir). If any more seasoning is needed you may add salt to taste and the other Onga cube. Return the pot to the heat and bring the rice to a boil, cover with foil a wrapper and the lid of the pot; then reduce the heat. Cook rice until al dente. After about 10-15minutes check the rice for doneness. 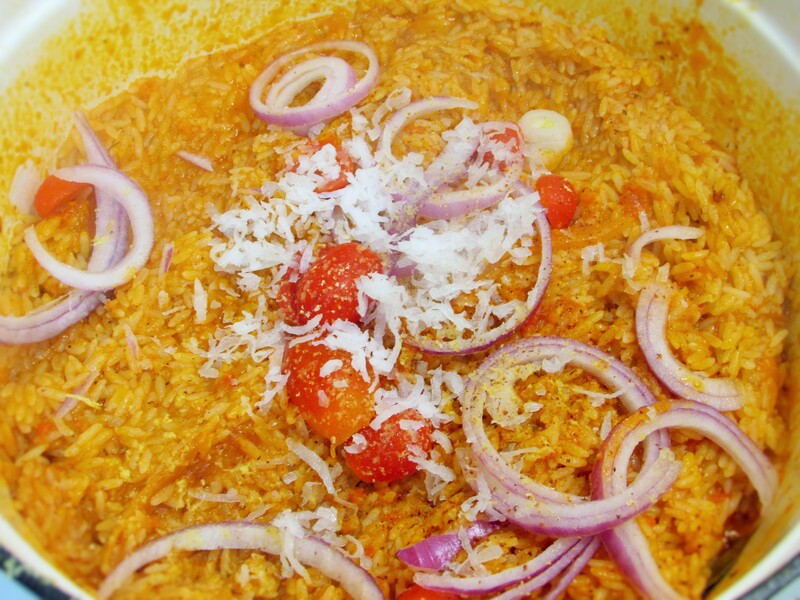 Add the grape tomatoes, desiccated coconut, chopped onions, nut meg and ginger. If the rice is still a little hard, remove the pot from heat or simply just reduce the heat and cover with the foil wrap and the tight lid for another 10minutes to cook in its own steam. Once done, stir and serve. If you like a slightly soft rice , you may add about ¼ cup of warm water, along with the garnishes. Cover the pot once more. After cooking for about a few minutes turn the heat off and let the rice sit covered for another 10minutes; then fluff and serve. 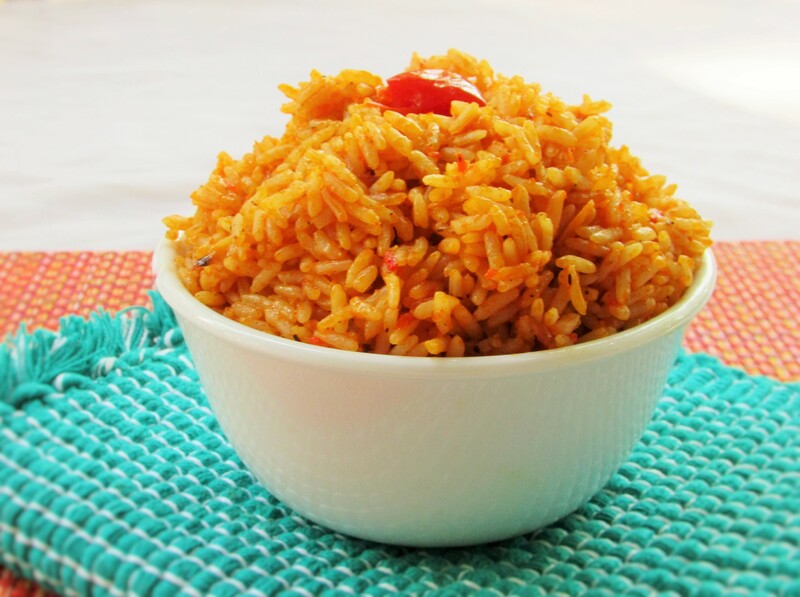 This entry was posted in Breakfast, Carbohydrate, coconut jollof rice, Coconut Rice, Fried Rice, jollof, Jollof rice, Lunch, main dishes, main meals, Nigerian Rice Recipe, Rice, Rice Dishes, Uncategorized and tagged coconut jollof rice, coconut jollof rice recipe, coconut rice, coconut rice recipe, jollof rice, Jollof rice recipe, Nigerian coconut jollof rice, Nigerian coconut jollof rice recipe, Nigerian coconut rice recipe, Rice and coconut, Rice recipe, rice recipes. Nma, thanks alot for this awesome recipe. Been looking for this recipe for ages, you’re God-sent my dear.. I’ll try it out next week and I’ll come and testify.. This recipe was very useful and the result was yum. I did a bit of twist to mine and made it like fried coconut rice by adding stir fried vegetables to mine. I didn’t use the tomato paste but it was also very nice. Thank you for this blog.